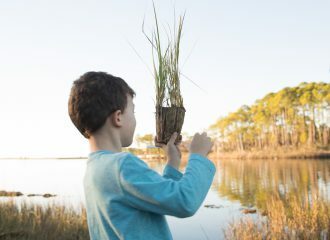 Grasses in Classes students tend salt marsh nurseries throughout the school year, and receive monthly education on local estuarine topics that meet Florida’s state science standards from CBA and CBA partners (e.g. AmeriCorps members). The year ends with a field trip to the Choctawhatchee Bay. 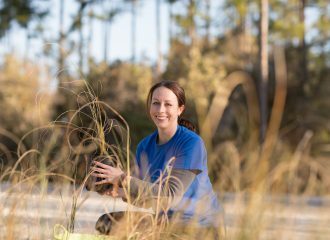 The Dunes in Schools program educates middle school students about the rare dune lake and barrier island ecosystems that exist in their local environment. Students begin the school year with an exploratory field trip to the beach where they collect data and restore the coastal habitat through planting sea oats. “From Shelves to Shores” is a hands-on science program offered at community libraries. The program runs for six weeks in June and July and is free and open to the public. 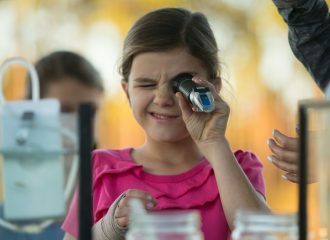 Activities include growing shoreline grasses, an interactive touch tank, and more. Our final activity will be an exciting trip to Choctawhatchee bay. 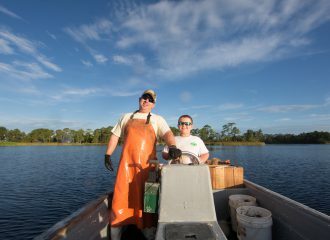 To engage area youth in oyster restoration, CBA offers a hands-on, place-based aquaculture program known as Spat On! to area high school students. 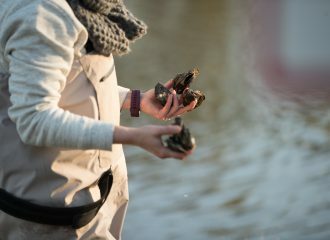 The initiative provides students with several hands-on activities and lessons that foster their understanding of oyster ecology and the estuarine habitat. Join CBA in promoting the health and wealth of local waterways by volunteering to take part in our mission. CBA offers volunteer opportunities for all ages and all physical capabilities!